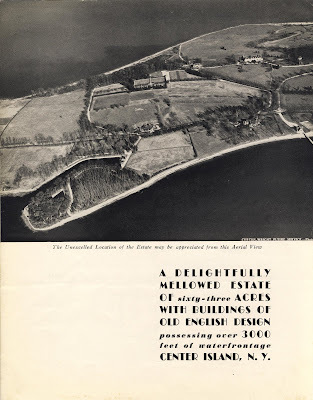 A brochure advertising 'Applegarth', the Charles Whitman Wetmore estate designed by Renwick, Aspinwall & Owen c. 1892 on Centre Island. 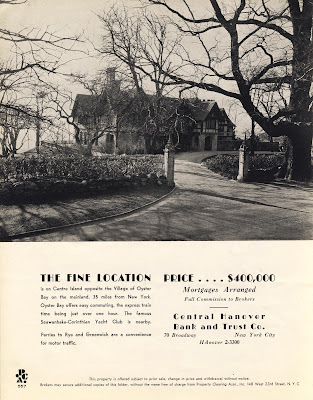 This brochure is from the late '30s or early '40s, just before the house was torn down. Click HERE for more on 'Applegarth' and HERE for interior shots. Click HERE to see where 'Applegarth' would have stood on google earth and what the estate grounds look like today. 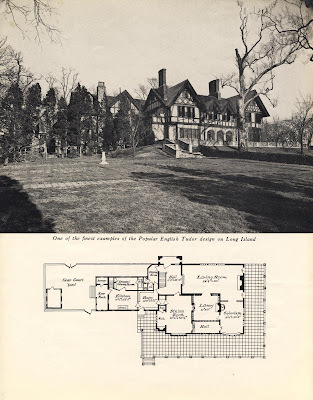 For me this posting really tells the story of what the long island country house era was at its best. Very fairytale lookng from the road in the last pic----but wasn't that a really stiff asking price for the era? one of my favorites on li. this is an incredible house with all that superfine woodwork - a tragic loss and the loss of the orchards that he tried to preserve as i see no remnants extant. 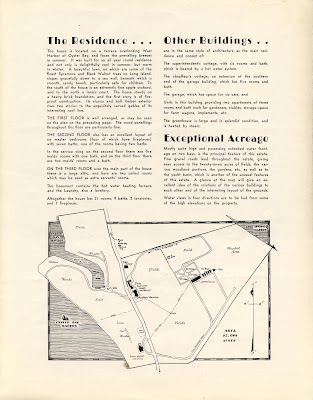 i suppose thats a lot of money but even at the time for 63 acres and over a half mile of continuos shoreline, it sounds like a heck of a deal. the real killer is the house that sits on the site is not so much smaller than the real thing. i love that last pic - as dilletante sez - very fairytale. i'm hooked. sorry - can't talk longer. got to get back to work on that time machine. don't worry - i'll take you with me. I'll be jiggered. I just gave this a second closer look with more time this evening, and noticed all kinds of things---the huge formal kitchen garden nestled way down in the field, and on the floor plan, that library, with its beefy georgian trim is actually a landlocked room, surrounded on all sides. Fascinating house. And oh, how sad to see the fields then, and the way it looks now, all subdivided and McMansioned...no wonder you're working so hard to record it. Long Island is swallowing itself alive. Wonderful website. A pleasure to look at a glorious life long gone.